Sunday at the 2014 London Fashion Week saw the official launch of a new collection of handbags by luxury fashion label Mulberry in collaboration with world famous British model Cara Delevingne . This made-in-England collection dubbed ‘Cara Delevingne Collection’, is the second celebrity collaboration for the brand since they teamed up U.S. singer Lana Del Rey in May 2012. The Cara Delevingne collection features bags in three sizes in three different finishes and also includes a limited edition bag inspired by inspired by the model’s lion tattoo, which she got with Rihanna last year. 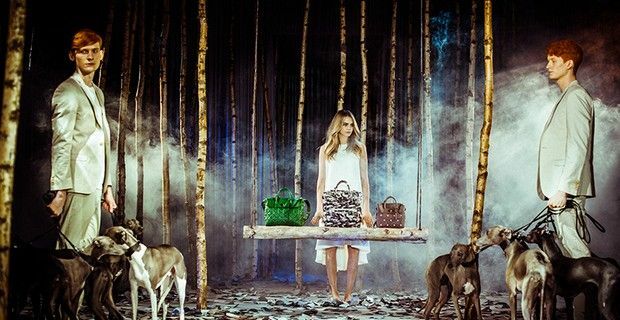 Delevingne who has been the face of two recent Mulberry campaigns showcased the newest Mulberry collection at the iconic Claridge Hotel, that was transformed in an English woodland scene that also featured a swing. The model who has "Made in England" tattooed on her foot wore a soft white dress and was barefoot for the presentation to show off the bags and was later joined by two male models who were holding onto pack of whippets. The bags are an original three-in-one style – elegant and versatile - and can take you from morning to night, as they can be used as a backpack, worn on the shoulder and or can be hand held for a more chic look. The small collection features such colors and skins, as khaki or grey camouflage prints in haircalf, a black, fantastic blue indigo or emerald quilted bag in nappa, and another stunning bag in taupe in silky calf with lion rivets. Inside each bag there is a lion rivet and small heart shaped patch based on Cara’s own heart tattoo. The bags prince range starts at 890 pounds and goes up to 2,500 pounds.